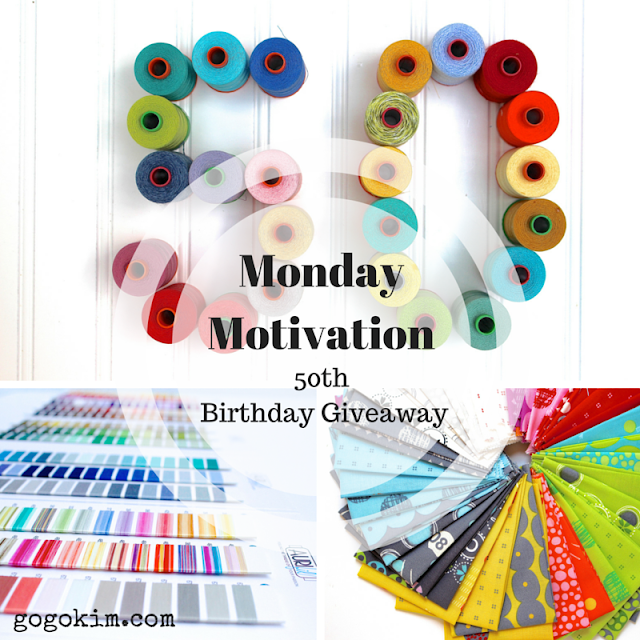 Monday Motivation Happy 50th Birthday Giveaway! Welcome back to Monday Motivation! Today is my 50th birthday! The thought had crossed my mind to do a thoughtful, insightful, soul searching post about being at the mid of my life. BORING!!!!! I tossed that idea for a FUN GIVEAWAY! I hope you will join me in the excitement of the day and participate in a fabulous giveaway to help make my milestone birthday a great day for everyone!!!! I AM FIFTY!!!!! LET'S CELEBRATE!!!!! 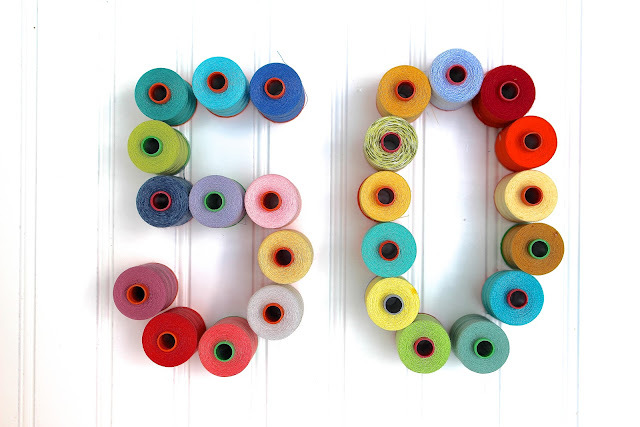 Oddly, to make the number 50, it takes 25 spools of Aurifil thread! Makes me wonder if it takes 50 to make the number 100 but I am not going to push it any further than 50 at the moment! ALL of these GORGEOUS threads are part of the giveaway! Also, in the giveaway is Hey Dot by Zen Chic for Moda! The bright colors and dots on every piece is amazingly clever! This is a layer cake folded to get the photo! Oh My Goodness! Look at all of the COLOR!!!!! And Aurifil Color Card! 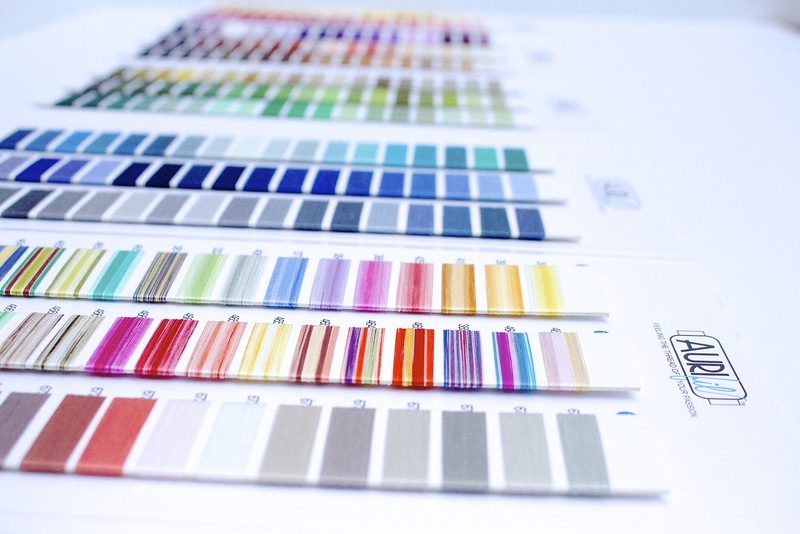 This card has 270 STUNNING thread samples to make a perfect selection every time! 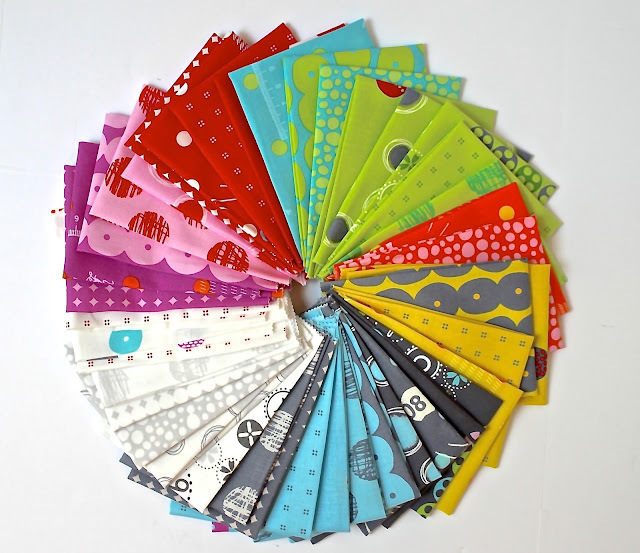 One very lucky winner will receive 25 spools of Aurifil thread ( colors and weights as shown) , Hey Dot by Zen Chic for Moda ( as shown) and one color card! The giveaway is open to all of my international friends! The giveaway will close 01 August and the winner will be announced on or about 03 August ( the kids are still home for Summer break so it may be 04 August). If you are a no reply Blogger, please leave your contact information in your comment. I am so very happy to be around another year and even happier that I get to celebrate it with YOU! 50 is Fabulous! Happy Birthday! Gee every birthday is amazing when you get older because it is a true celebration. Best ever? I think the year I turned 40 was pretty amazing. I had to work that day, I wasn't going to be in the office, but I stopped by early to get something. There were black balloons and that type thing at my desk. I laughed and thought - YES! I made it this far and I have a lot of life left in me. Some friends also had a small party for me the following weekend. I got my first Kindle (because I AM a reader.) It was a delight. Enjoy your day and your 50th year!!! Happy happy birthday! For my 34 bday I had nothing planned but I had so many little surprises from friends. It is the little things! Happy special birthday! I just had a big 0 birthday (but a bit bigger than yours) and my friends made it extra special for me. I had two weeks of celebrations, including a surprise morning tea with all my favourite former colleagues, a fabulous dinner with my family (with lots of wine and laughter), and the final celebrations was lunch in Melbourne's Tramcar restaurant with my oldest friend (we've know each other for 56 years!). And in between the celebrations I managed to do lots of quilting. Life is good. 50 years ! Just the beginning of the 50 future great years ! Happy birthday To you !!! Happy 50th birthday and what an awesome giveaway! HAPPY BIRTHDAY! Aren't we supposed to be giving YOU presents?!?!?! 50 isn't too bad, I reached it almost 3 years ago and it sure beats the alternative! For my 30th birthday, my parents came to mind the children and my husband and I flew to London for 3 days of museums, parks, concert, musical, restaurants, shopping... It was amazing! My favorite birthday memory is a yellow cake with dark chocolate frosting that my mother made in the shap of a seven for my 7th birthday. Happy Blessed 50. My mom surprised my coworkers and me with lunch. Tacos, rice and beans. She has been gone for 6 yrs now. My favorite birthdays were all in college. They were always filled with lots of friends, good food, staying up too late, and launching until it hurts. Fifty and fabulous!! There is seriously no way you're 50, though... I hope you have the best, most fabulously celebratory day ever! Coffee, sewing, wine, good friends, CAKE!! You know, all those!! Happy birthday! My favorite memory is of my 25th. My husband and I had just moved into our first house, and we had a big party. It was great! My best birthday was my 33rd. My daughter was born the month before, so it was my first birthday as a mom. My little sister and I have birthdays that are 10 days apart. I remember the one birthday party that we had together. Nothing big, just the kids in the neighborhood. Still have pictures to remember by and that was over 55 years ago. Birthday parties have come a long way! Happy birthday! My 50th was celebrated in the framework of our house under construction with rain coming in through the unfinished roof! Happy 50th! It's a milestone birthday but it's also just a number. Enjoy your day! Happy Birthday! I also turned 50 this year! YAY US! My favorite birthday memory is my 9th birthday. I received my first two wheeler and we had a party at an amusement park. My best birthday so far, was this year. My husband bought me a Singer Featherweight. I had been wanting one for 12 years. I always look forward to you posts on FB and Pintrest. I hope you have a wonderful birthday and many more to come. My favorite birthday was getting to see Harry Connick Jr in a small theater in Paris. Happy birthday! My best birthday ever happened to be my 50th! My daughters surprised me with a surprise party of family and friends - my one and only surprise party. Thanks for the great giveaway. You sure know how to party! Happy Birthday! Best birthday memory? I threw myself a 50th Birthday Party. Family came in from out of town to celebrate with my friends. We all had a great time. What could be better than to share laughter with those you love. Happy Birthday! We find new 'fun' as we age. I hit 60 on my next birthday, finding a new freedom in life! Even in my quilting, using brighter colors and different patterns. Enjoy! Congratulations! It only gets better. I'm turning 50 in October. My favorite birthday memory is my 16th birthday, the last "normal" one of my youth before my mom had a stroke and never lived at home again. I invited my cheerleading squad over for supper (it was game night) and mom made lasagne and the requisite chocolate layer birthday cake. I miss her so much! Happy 50th!!!! I hope you have a fantastic day. Thank you for the awesome giveaway. My birthday falls at the end of June, I loved that as a kid because in some places I lived, that meant the fair was around. One bday, my family went to the fair to celebrate! My Dad told my 3 sisters that I got to choose the first ride everyone went on. I chose the farris wheel, and my sisters HATED that choice!! LOL. Loved it! Happy birthday! I loved turning 50! Wishing you a wonderful year to come. Wishing you the happiest of birthdays! A favorite memory of mine was from when I was young and my mom would make angel food cake with pink icing. I would eat a little of the cake but mainly the icing because I don't like angel food cake. It wasn't until I was in my forties that I told her. She laugged. You certainly don't appear like you are 50!!! My favorite birthday was when my husband surprised me with a day with him. He had called my boss and arranged a day off. I still went to work and he had put a card on my desk to come out to the parking lot. We went for breakfast, golfed, had lunch and just enjoyed a beautiful day without kids. When I was 19 all of my friends threw me a surprise party. It was awesome because I was bummed out I had to work that day and I had no clue anyone had anything planned. I never really do anything for my birthday so that's the best so far. Happy Happy 50th Birthday! Wishing you a Blessed Day and Year ;-D. I remember my 18th birthday, I got a 10 speed bike that year. Awesome and Generous giveaway! Thanks for a chance to win. Happy birthday! Hope you have a great day! I think my best birthday was when I turned 30! I got married and my first child was christened! My favorite birthday memory is having a skating party with my sister. Our birthdays are 7 days apart and we're the same age for that week - I was almost her first birthday present. We were in elementary school and I don't remember which year. Both of us are summer birthdays and that was our one and only party. Yay for July and August birthdays. Mine is July 29th. Have a wonderful birthday - 50 is great! Happy Birthday! I hope you have a fabulous celebration. When I was young, maybe 5 or 6, my Mum made me a birthday cake in the shape of a bed, with two little mice snuggled under a quilt with their pairs of slippers at the foot of the bed. It was so detailed and beautiful and everything was made with marzipan icing. Unfortunately, I ate rather too much marzipan and ended up being rather ill...but I loved that cake and I've always remembered it! My favorite memory is camping when I was a kid for my 10th birthday :) Thanks for the chance to win this awesome prize pack. Happy Birthday! First - I can't believe my double (Kim/Kim) is 50! Happy Happy HAPPY Birthday! I personally love all my birthdays - when I turned 30 I purchased a fabulous crown of twigs and flowers which I know wear every year - even to the grocery store and gym! My favorite is when folks compliment my crown like I would just be wearing it on any normal day to the gym :) I had a big party for my 30th and we played minute to win games, had a nacho bar, and all my friends over! It was perfect! I hope you have a fabulous day! Happy birthday, Kim!! 50 is exciting! My favorite birthday memory is from my 40th birthday. I threw myself a party in our backyard, invited all my friends and their families to swim in our pool, with a cotton candy machine, bubblegum, Skittles, Starbursts, and boiled peanuts! And my sister got on a plane for the very first time to be there! I don't have any one birthday that stands out, but I loved when my kids were little and made me gifts and cards! What a great way to celebrate! Favorite birthday memory was going up to Paducah with my best friend and taking in the museum for the first time! My 50th is this year too - in October. What a great way to celebrate. My favorite memory is of my sister and I making my birthday cake for my 13th birthday. We used peanuts to write out 13. It was simple but was the first cake I ever decorated and I was so excited. I rode my first, and only, century on my 50th birthday. One of my favorite birthday memories is when I was meeting my (not yet) husband's parents. It was Thanksgiving (my birthday is November 28), my 19th birthday, & they have the tradition of making whatever the birthday person wants for supper. I chose corned beef & cabbage, which his mother had never made before. We had a great time, though! Happy Birthday!!!! Welcome to the 50's club!!!! What an assessment giveaway, thanks for the chance to win!!! My favorite bday memories were my daughters. She always loved getting the cake that was her age number. The fancier the better too!!! I had my 16 the in Russia. I got surprised with a jam cake covered with flowers. My 40th was also glorious. My husband planned all these kid activities for me to not feel old. We played mini golf, which I love. My best birthday memories involve lovely people throwing surprise parties for me. It's happened twice, once by a lovely group of university friends and once by a friend who much later went on to become my husband. The second time was all the more special because I was in a new town, had not long started a new job and didn't know many people. Somehow my university friends had all been contacted and came along; I genuinely had no idea and spent most of the party shell shocked! Happy 50th! I hope you get thoroughly spoilt and thank you so much for the very generous giveaway. 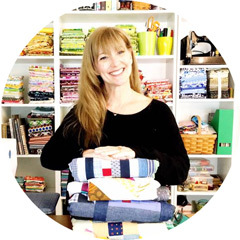 I Can't think of any particularly exciting birthdays past, but I'm super excited for this year's birthday because my cousin Yvonne and I are renting a condo on the beach and sewing for a week! Being 56, I am going waaaay back: I turned 12, just had a new 1 month old brother, and Mom and dad said YES to a 6 girl slumber party!!!! Nearing 50 was hard-being there is a BLAST, Enjoy! 🎉🎉🎉Happy Birthday🎉🎉🎉 My best birthday ever was a surprise birthday that my kids, my mom and my best friend planned for my 50th. I was truly surprised!! My mom had recently run into my best friend from when I was 13, so she was there also. 👭 We hadn't seen each other for many years so that was so much fun!!! She died in a freak accident 1year later. I cherish that memory of her. Happy birthday! I don't know how you feel but I hard time believing I was 50, when I had my 50th birthday 4 years ago. The time goes by so fast. Enjoy it! Happy Birthday! Favorite birthday was this year - dirty 30! So many great memories. What an awesome giveaway!!! Wishing you a wonderful birthday filled with fun surprises!!! For my 40th my hubby pulled off a total surprise party with about 25 guests! Right at home! My best birthday ever was 14. My parents got pizza, and I ate 4 slices. They also got me a birthday cake, and I ate two slices of that. Pizza and cake? Yes, please! Best birthday ever was definitely 50! Enjoy! Happy Birthday! I love that you made 50 with 25 spools of thread! My favorite memory is pretty simple. I was dating my husband and he'd sent me a package with a lichen covered rock in it. He told me about his hike to find it and I think it's still my very favorite thing he's ever given me. My mom set up a pretty breakfast for me and the package was sitting on my chair. It's been a long time ago, but it's till my favorite. First, wishing you a FABULOUS BIRTHDAY! My favorite birthday memory was when I was a kid and we had a family reunion in Yosemite Park, CA. It was back in the day when there was firefalls, fireworks that are shot at the top of the waterfalls. We all had cabins and tents and food everywhere. It was outstanding and it was my birthday on top of all that. 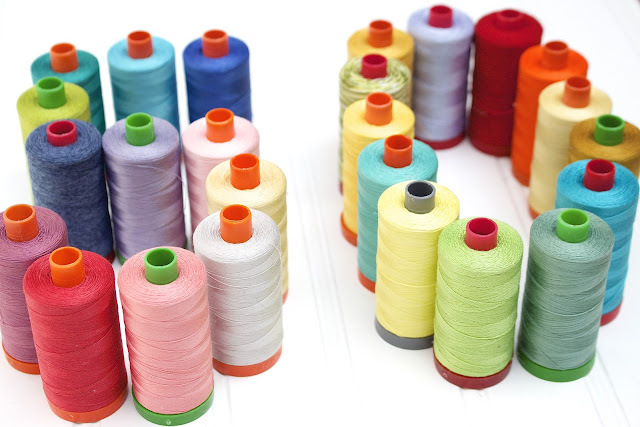 PS: I love, love, love Aurifil thread, use it all the time. My favorite birthday memory was when I was about 13 and I got the coolest outfit, coca-cola pants and hat with a matching red shirt. I thought I was the bomb wearing those. Just being with family is the best birthdays. Since my husband passed almost 5 years ago my birthdays have been lonely. Happy birthday to you! Hope you have a great day with awesome memories! Happy Birthday!! This year will be my 50th as well. Enjoy your day!! Thanks for the chance for this awesome giveaway! I actually have 2 favorite birthday memories....I was born on a saints feast day and as a young girl in Catholic school, we always went to mass on my birthday. Was very disappointed to find I was not the cause of the celebration! When I was older and living on my own, my mom would make my favorite dinner and bring it by for our evening meal. I would get home from work and whatever kids activities going on, and we would sit down to a delicious dinner that I didn't have to make! My mom was a wonderful cook...just one of the many things I miss and love about her. Happy Birthday Kim. My favorite birthday memory was at age twelve when I invited all the girls from my class for a party. In our family this was a once in a lifetime event!! Happy 50th! Favorite birthday was my 50th where my hubby took me on a cruise to Alaska! First cruise and we had a blast! 50's are fabulous! I grew up with two families, one living in Northern Cal, one in Southern Cal, and one of my best birthday memories is the year I flew from visiting N. Cal to Southern Cal--having been feted and loved and surrounded by nearly every special person in my life on the same day. My 49th birthday I got my first Corvette! It was an older model, metallic aqua blue with fiberglass roof...she was a beauty and I named her Chrissy....best birthday ever! Happy Birthday to you, you young thang! I was 50 a few years ago and it was a blast! We have a tradition amongst my friends to hang bras in the yard on decade birthdays, so that year it was my turn to get the "support"! Later that night, we went out and celebrated with Mexican food and the best margaritas in town. Enjoy your day, whatever you do! I've had a few fabulous birthdays (today being one of them so far). One of my most memorable was when my "friend" from Canada came to visit me, and he made me dinner, and we went to the beach and had a fabulous few days together. He is now my husband. More recently, my daughter was born five days after my 29th birthday, so the past few years we have done a backyard BBQ to celebrate both of our birthdays (last year she was 3, and I turned three two!). Happy birthday to both you and me! HAPPY 50TH BIRTHDAY! My favorite Birthday Memory was receiving my beautiful Doll House! Hours and hours of fun with my sister and other friends playing House!! !THANKS FOR A GRAND GIVEAWAY! happy birthday! 50 is great! my best birthday memory is spending my 50th birthday in Manhattan with a good friend. Menopause in the City! The first year I received my first handmade card from from kids! Happy Birthday!!! I went into labor on my 27th birthday--best present ever! My birthday is when school starts each year so I really don't remember a special birthday on my birthday. Usually celebrating before or after the actual day. I was 21 and it was the first time I'd ever had fried ice cream! Happy Birthday! May you have many more. No favorite birthday memories probably because my birthday is in the first part of January. Everyone seems to be broke, partied out and still trying to keep to their resolutions. Finally I decided to celebrate on my own. Now I treat myself to after Christmas sales and usually a trip. And I celebrate the entire month. Thanks for the fab giveaway. Happy Birthday. I got tickets to see 42nd Street on Broadway for my birthday, and the show was a month later. It was fun to keep celebrating for the whole month, including dinner before the show. Hope you're having a fun day, and thanks for the give-away. We are all celebrating with you, one big giveaway party! My best birthday was my 31st & an expected mommy carrying my first born after many years of waiting, now he is 24 years old! Thanks for a wonderful giveaway! Happy 50th! I think my favorite birthday memory is still from when I was about 10. I have a summer birthday so I didn't usually have a school party. That year my mom totally surprised me with a party and I had no idea it was coming! In college my boyfriend, now husband, threw surprise parties for me every year. Yes, I was always surprised! Happy Birthday Kim! Wishing you all the best on your special day! Thank you for the awesome giveaway. My special birthday was the year I turned 40. My daughter gave me a pair of diamond earrings. It was the best gift ever. My best birthay was 9 years ago when I was giving birth to my first child. He was born the day after. Happy birthday! I turned 50 a couple of years ago, and it was a fun birthday, but the one I remember best was when I was 8 or 9. We always had homemade cakes for our birthdays, never the "fancy" bakery cakes. At the end of the school year, they had a fair and at the cake walk, I won a "fancy" cake. We took it home, wrapped the box in plastic wrap and put it in the deep freezer until my birthday. The cake was awesome and still pretty even after being frozen for a month. That was one of the best memories I have of a special birthday! A very Happy Birthday! You are just a youngun! Hope your special day is as fantastic as you want it to be. Happy Birthday! Thanks for sharing your special day with us. A favorite birthday memory is a trip to the zoo with my husband and some friends. The penguins were dancing with our shadows. Happy Day! My favorite birthday was when a friend attempted to surprise me, gathering all sorts of friends at my favorite restaurant when I expected just her. Except i locked myself out of my house so was delayed, and called the restaurant to warn her i was running late - and the waiter said he would tell "everyone at your party"!!! It did not matter to me, it was a wonderful gathering of very lovely people. But it still makes me giggle! I remember my Nana and Papa being at every single birthday of mine growing up. They were the best! And they always gave the siblings a little gift to open so it was not just the birthday kid. Two years ago, I was on a cruise with my sister on my birthday. We arranged it so we were in Grand Cayman on my special day and it sure was extra special because not only did we swim with stingrays but we also swam with dolphins! That's one birthday I won't forget! Happy birthday! I remember looking for the fairies in the fairy castle cake my mam made for my (about) sixth birthday. Never did find them! My 50th birthday was pretty great, because my husband bought me my Bernina. Happy Birthday! Happy Bday. My best birthday memories are just of all the fun I've had seeing my family and friends. Happiest of birthdays, hope you have a fantabulous day! Happy 50th Birthday and best wishes for 50 more! A favourite birthday memory is a surprise birthday party on my 30th birthday. I was totally surprised! Wow! Congratulations on this milestone! Hope it's a wonderful day! What a generous giveaway! My family had a tradition where everyone would come into the birthday child's room singing happy birthday, throwing the presents on the bed to be opened. We loved it. Didn't have to wait until evening to open the gifts! Happy Birthday! My favorite birthday is when I have a party! I love get togethers and cake; but, I can do without presents. I haven't had a party in years as my folks are gone and no one in my family seems to like parties these days. Happy Birthday! I celebrated my birthday on a Singapore Airlines plane once. I was given a gift, a card from the pilot, champagne and cake. I also got to go up to the cockpit and saw an amazing sunset as we left the Australian coast. Gorgeous!!! What a way to celebrate! My parents surprised me with a birthday party at school. It was nice. Happy Birthday! I got engaged on my 21st birthday. We are still married- 32 years later. Most recent favorite memory: cake for breakfast with my grandson! For my 50th, everyone at my office decorated it with lots of black balloons and such. It was special! I was thinking the same thing, no way you are 50! Happy Birthday! The best birthday party I ever had was when I turned 9!! My friends and family had a blast with one game we invented... Spinning around in a giant stainless steel bowl!! My most memorable birthday was my 40th when I found out I was unexpectedly pregnant with my 3 child. My youngest are 12 years and one day apart. This year my husband took off of work and we drove 4 hours to go to a store I wanted and then we got back in the car to go to the Missouri Star Quilt Co. He did not feel well but he still powered through the shops and I bought what I came for and it was a super nice change of pace. Happy Birthday!! My favorite birthday will be on Aug 8 when I turn 60 and my family will be gathered. Happy bday! What an amazing giveaway! My best birthday memory is a trip to Hawaii with my husband. Snorkeling, swimming, sun, sand, great food and total relaxation in the midst of winter. Heavenly! Wow girl! You know how to celebrate!!! 50 is so fun! Happy birthday! I can't actually think of a special birthday memory. We never made a big deal over birthdays in my family. We had some cake, blew out candles, no big deal. My best birthday was this year. A group of friends went with me to a show and I got to spend time with my brother and a friend who really got along well. It was low key and fun! Happy birthday Kim!!! My favourite birthday memory was when my partner took me out for my 24th birthday and proposed whilst we were at dinner. We both turn 50 next year and already planning a trip overseas to celebrate our birthdays together. I'm only 55, so...maybe I haven't had my best-ever birthday yet!! Just had my 60th on Saturday. Love the thread and all the beautiful fabric.Quilting is definitely my favorite way to relax. My favorite birthday memory was sitting by St Clair river reading a book and watching the boats and barges going by and eating dinner over looking the river. Hope your 50th is your best birthday yet. Happy Birthday! What a fun way to celebrate! As we grew up, every birthday meant no chores (or dishes) for the day. Birthday highlight was choosing one friend to spend the night. We were able to choose the flavor of birthday cake. Those were the good ole days! Happy Birthday! Happy 50th birthday!! My favorite birthday memory is when I turned 30 and was pregnant with our first child. I thought my husband was taking me out to dinner, but we headed to the airport and went on a long weekend trip to San Antonio! He had packed everything for both of us, had the airline tickets and a hotel on the Riverwalk booked. It was amazing!! I had my 20th birthday at a French summer camp where I was working. My job didn't require me to speak French but the counselors did. For my birthday, during supper I sat in the front of the room and they all sang me "Happy Birthday" in French. They also had made me a cake. That was a fun birthday because it was different. This year (in a few days!) I will be celebrating my 23rd birthday. I am looking forward to that too, because I am having a few friends over for a Jane Austen themed party. Happy Birthday to you!! Hmm, my favorite birthday would have to be my 30th. I had just moved several hours away,and was really missing all my friends and family. My birthday was on a Sunday, so my church family, had a birthday cake, and 30 gifts, plus sang Happy birthday,right after church.I felt so tremendously loved!! Each birthday is precious! Happy Birthday to you! Hope your 50th is wonderful! Only too happy to help you celebrate your 50th by entering your fabulous giveaway. What gorgeous fabrics and cottons. I must say you look great for 50. I firmly believe age is an attitude. I hope you have a fabulous birthday. My favorite Birthday memory was my 40th. My coworker planned a big event for the evening and decorated my desk and gave me a birthday crown. We had the most delicious cake. After work the rest of my coworkers came to a great feast and fun. You sure know how to set the stage for a celebration. I always enjoy birthdays. My son makes me cards and decorations, and I get to buy fabric, and we go out to eat. So much fun! My grandmother would make angel food cake, strawberries and whip cream, the best! Happy birthday! I think turning 60 was the best for me because I retired. Happy, happy birthday, Kim!! My favorite birthday was my 45th...I was notified in April that my daugher-in-law was pregnant with my first grandchild arriving in October. What a terrific present! a very happy birthday to you, they 70 is the new 50 and that is what I will be next year so 50 must be the new 30? Happy Birthday Kim! Hope your 50th year is filled with joy! Happy birthday! Enjoy your day! Happy birthday, enjoy your day! My best birthday memory is when I was 7 or 8, I was offered a guitar. There was hard times for my parents' ears but Heaven for me!! I still have it, and play sometimes. Congratulations with your birthday! So very exciting! And what a great giveaway! You really went above and beyond! Thanks so much. I have two great memories: the first being a Barbie-cake (I must have been around six) and the second is when I got to celebrate my birthday in Canada being on a boat surrounded with whales :):):). It was such a beautiful sight! Happy Birthday, Kim! Welcome to the Mature Side!!! I have a funny story for you. On my birthday that just passed I had a few cakes! Hubby and the kids know I love my sweets and they all wanted to surprise me. Unfortunately (or fortunately, for me!) there were a few cakes purchased! Yummy! Thanks for a great giveaway! Enjoy this very special day! My best memory is when they sang - Hippo Birdie Two Ewes! O Happy Day! I'm sure 50 feels like turning 30 Only Better! I hope you had a fabulous day! Thank you for sharing your special day with us! Happy Birthday! Celebrate all week long! I had a fun sparkly party when I was 5. Balloons!